After 5 years on the BMW F800S, it the thought of a new bike came creeping in on me. I was really happy with the F800, so it took me quite a while to make the decision to swap the primary bike in the garage. Proper suspension and brakes – The bike must be fun and competent in the twisties. Comfort – I’m getting older…. Can carry a reasonable amount of luggage – I’m travelling light, but not without luggage. The Triumph Street Triple was in play, but it’s a physical small bike, and I’m 1,87 meter. BMW S1000R was interesting too, but it’s a four cylinder and the price is a bit on the high side. 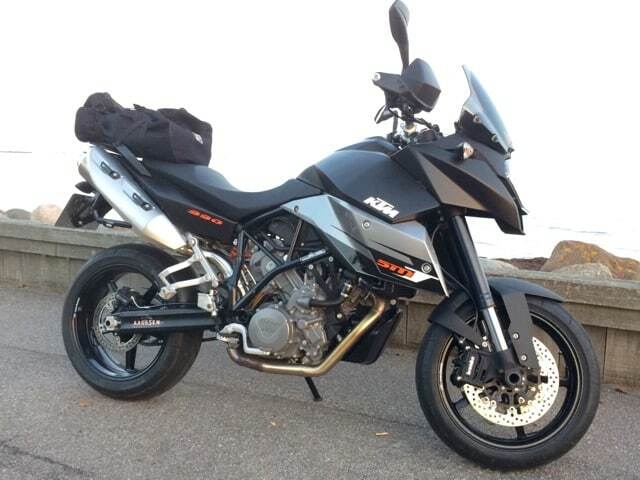 KTM 990 SMT – For some reason I never considered the 990 Super Duke, maybe because I already have the Duke 690. Anyway, the 990 SMT was on the expensive side too. So, one bike to small to be comfortable, and two was too expensive, so there was no obvious choice. But when I was offered a brand new 2009 leftover SMT at a reasonable price, the choice was easy – The KTM 990 SMT is now my primary bike for the next years. 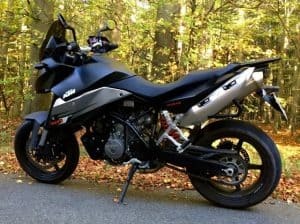 I haven’t been disappointed: Steering is very fast and precise, the suspension will cover all road conditions and provides lots of feedback, the brakes are powerful enough to slow down the earth’s rotation, and the engine is powerful and amazingly fast reving due to very lightweight internals. Comfort is among the best I ever tried, and it will haul the luggage I need. Details on all modifications here.